SEPANG, 7 July 2012 – A solar car built and designed by students of The National University of Malaysia (UKM) won in the urban concept solar category at the Shell Asia Eco Marathon here today. The winning car ‘UKM 1’ was judged the most energy efficient car in the category. The team received a cash prize of US$2000 and a trophy. Students taking part in the event needed to design, build and test vehicles that can go the furthest distance using the least amount of energy. A total of 119 teams of university students from 18 countries/territories in the region took part in the event at the Sepang International Circuit (SIC) to showcase their futuristic designs following similar events held in the Americas and Europe earlier this year. 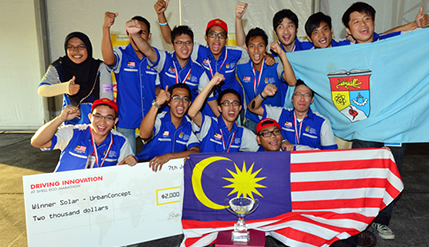 The Shell Asia Eco Marathon is the Asian leg of the annual event. The UKM winning team leader, Neo Ron Gen, a mechanical engineering student attributed their victory to team work, dedication and guidance by their lecturer, Zulkhairi Zainol Abidin whom he likened as being more like a friend than their lecturer. The team designed and built a 4-wheeled fuel-economy vehicle that looks similar to passenger cars on the roads. In addition to meeting specific height, width, length and weight, the Urban Concept vehicle must be capable of being driven in wet weather conditions. Two other cars designed and built by UKM students also competed in the race for the prototype category using ethanol and hydrogen as their power source. The prototype vehicles are typically smaller in size and more futuristic-looking designed to reduce drag and maximise efficiency. Teams from University Malaya (UM), University Sains Malaysia (USM), Universiti Teknologi MARA (UiTM) and University Malaysia Pahang (UMP) who competed also won in the various other categories. The team of students from Dhurakij Pubdit University Thailand emerged the overall best run covering a total of 2,903 km (equivalent to driving from Kuala Lumpur to Hanoi) from one litre of fuel. Ambassadors, stakeholders and business leaders from Malaysia and around the region were among the over 1,500 guests witnessing the innovative vehicles on the track.